Before delving into the 7 essential employee engagement questions for HR managers to focus on, it might be interesting to note that Officevibe does not actually have an HR department. You can read more about why here, in a one-on-one interview with our VP of Culture and Organization (CO). The underlying thought process for our move from HR to CO is one that qualifies employees as people, and not as resources. 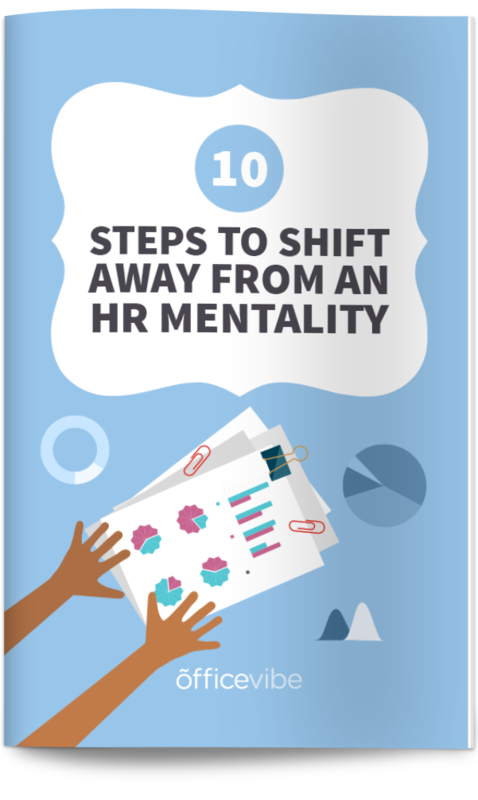 The reason we mention this is in this post is because the employee engagement questions that we urge HR managers to keep a pulse on are very human-centric, including themes such as values, ethics, equality, company mission and organizational culture. Download this list of personal ways you can start shifting your mindset towards Culture and Organization, written by our VP of CO.
On a scale from 0-10, how likely are you to recommend your organization as a good place to work? This question category is essential for HR departments because employees can be great recruiting tools. When employees are happy with their organization and overall experience at the company, they naturally promote the brand, helping to recruit top talent almost inadvertently. On the other hand, when employees are not happy or engaged at their organization, they can act as detractors. This question is part of the eNPS (employee net promoter score) and it is probably one of the most important questions for you to keep a pulse on. The first way to engage your teams is to find out where their pain points are, so when you discover detractors, follow up to see where you can help them improve their overall experience. People from all backgrounds are treated fairly in my organization. This question is key to ensuring a healthy, unbiased climate of equality in the workspace. It seems obvious that in this day and age, one’s cultural, racial or ethnic background would have no bearings on the way they are treated, however (and sadly) it’s still not safe to assume, as equality is not always the reality. It is the responsibility of the company to guarantee that equality is executed by and felt from all employees and managers, company-wide. This post, written by a Diversity and Equality Consultant, offers great advice on creating company diversity policies. He prefaces the post by suggesting that diversity should not only be respected, but valued, as all companies can benefit from diverse perspectives of those who are not the same. When you say what organization you work for, how do you feel? How an employee feels when they are asked the commonplace question “where do you work?” is important. Ultimately, you want everyone to feel proud of their organization because the way in which we interact and engage with anything in our life is a direct effect of how we feel about it. The greater the sense of pride one has in their organization, the great their work will be. What does your company do that makes its people feel proud? Think about implementing environmentally-conscious programs, or ensure that you are socially responsible by giving back to the community in a meaningful way. For example, if you are a publishing house, plant trees to compensate for the paper you use. The way our organization makes decisions is a reflection of our values. The question of alignment is key for all companies to consider. Do the values that you represent follow in line with the way your company makes decisions? There needs to be a cohesion and alignment regarding the values that are preached and the way that the company acts upon the values and functions internally. Learning how your teams of employees feel about this is important because a lack of alignment can cause disengagement across the board. For example, if your organization values employee autonomy and trust, ensure that your managers are not micromanaging. Or, if your company offers the opportunity to work remotely, ensure that employees feel comfortable using this perk. No company is perfect so it is entirely possible to stray off course inadvertently every now and then. The best you can do is to get feedback on it, reflect, and validate your employees feelings and concerns. Is your organization’s long-term vision clear to you? The term “clarity” might be one of the most important words to keep at top of mind at all times. The reason for this is because when people are able to grasp and understand what they are working towards, and why, the work that goes into it becomes more meaningful. Ensure that your managers reiterate the company vision, mission and goals often, so that employees feel a constant connection to the work that they are doing. There is no magic formula for ensuring that people are aligned and share a common understanding of the mission or task at hand. The only way to succeed is for all team members, regardless of rank or position, to make sure that clarity comes first in all interactions. Do you feel like your work environment reflects your organizational culture? Organizational culture, the system of shared values and beliefs promoted by the company, needs to be reflected in all areas of the workplace. From the way you communicate to the way the office is laid out. This is called “cohesion”, and it’s key to the success of your company because the lack of cohesion and alignment is a catalyst to disengagement. This question will help ensure that employees feel as though the way the company promotes itself is in line with the work environment at the office. For example, Officevibe promotes and values a fun company culture and workspace, and in order to act on this they have ensured that the offices reflect this. We have a ping pong room, skateboard ramp, inspiration quotes plastered in life size writing up on the walls, and a room with hammocks and bean bag chairs to brainstorm in. I feel like I can voice my opinions regarding my organization. Is the culture of your organization one that encourages employees to share their thoughts (good, bad and ugly) about the company? If your answer is yes, are you sure? It’s important to know how employees feel about this, because if they do not feel that they can share their ideas, thoughts, and concerns, then the company is depriving itself of the potential for great, forward-thinking ideas. Chances are, your employees are withholding valuable intelligence from you…maybe they’re not sharing their thoughts on ways the business could grow its sales or improve operations. No matter how open you are as a manager, our research shows, many of your people are more likely to keep mum than to question initiatives or suggest new ideas at work. Your employees are your best assets, and not offering an open environment that is accepting of their insights will work to the company’s detriment. But how do you ensure that employees feel free to share? On a human level, it’s being free to listen to employees whenever they feel they need to speak, honouring that “open-door policy” most companies claim to have, but then taking it to the next level by promoting a safe “vocal culture”. Thanks for reading this post! We’d love to hear your thoughts in the comments below.